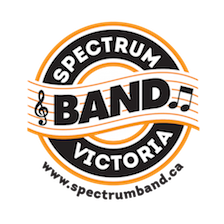 Spectrum Band Wear - Sound. Appearance. Precision. SPECTRUM BAND - Band Wear! Spectrum Band Wear will be available for purchase Fall of 2018. Check back often as information becomes available! 5.) Slouchy Toque ('Spectrum Band' on front) - $16.00 - Black with Grey Logo, Grey with Black Logo. One size fits all. Grad Option: +$5 to add "Grad 2018"
Add Name or Instrument: +$5 to add your name or instrument on a sleeve.